Dark Emperor evocatively depicts the nocturnal creatures and happenings of the forest ecosystem. Using a number of different rhyme schemes and poetic forms, the 12 poems on double-page spreads are full of interesting information about each creature and are accompanied by elaborate illustrations that, like the poems, are full of informative details. Below is a sample spread from inside this book. The text should be legible enough so you can get an idea of Sidman's evocative poetry and the second page provides a sample of Allen's stunning and unique illustrations that were created via a linoleum-block printmaking technique. 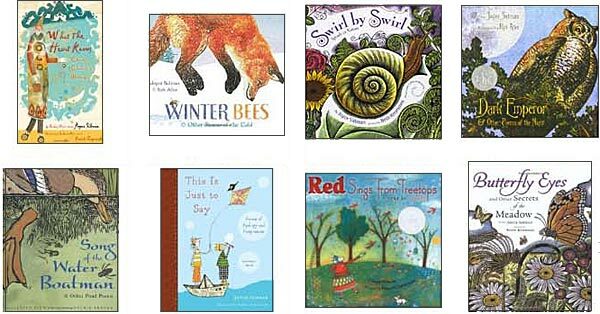 Joyce Sidman has a lot of great children's books. 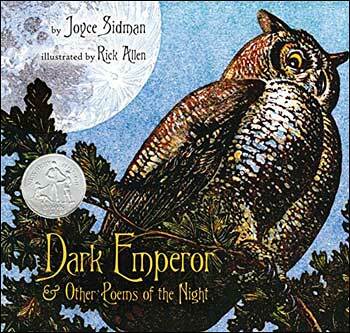 If you enjoy this award-winning book, be sure to check out Joyce Sidman's other books.